Tool Blog News Is DeWalt Working On A Saw Stop Mandate Work-Around? If you have done any reading on the purposed Saw Stop mandate, you have probably noticed that most of the article writers are against it. It is not that we are against safety, we just don't like being told what to do, let alone by politicians that have probably never even used a table saw. And since we have the inventor of the Saw Stop to blame for these new safety regulations, I would be perfectly happy to see the manufacturers find a way to not use his patents. A Black & Decker patent filing indeed shows that at least some of the brands are working on their on flesh detecting safety devices. Filed back in September of 2010, Black & Decker patent Application 20110079124 describes a "sensing mechanism for user contact with an active portion of the power tool..." and "a safety mechanism for preventing prolonged user contact with the active portion...". "The safety mechanism is configured to actuate upon receipt of a signal from the sensing mechanism." So far this sounds a lot like what the saw stop does, but not when the second part is explained further. "Alternatively, according to a second aspect, the safety mechanism is arranged to rapidly urge an extremity of the user away from the active portion of the power tool." So from what I understand, the safety mechanism detects contact with the blade (active portion), but instead of stopping the blade, a second safety mechanism is used to move your hand away from the blade. 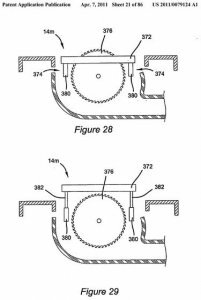 Further down in the patent application is an example on how their system could work on a table saw. When a portion of the users body (hand) gets close enough to the blade to trigger the safety mechanism, the kerf plate of the table saw is driven upward to push the hand (and likely the material being cut) up and away from the saw blade (see picture). 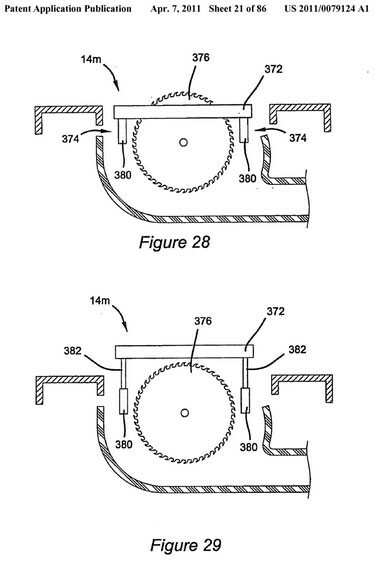 So is this system different enough from the Saw Stop that will be granted its patent? It would be interesting to see how well it would work in real life. I am sure the event would be scary a first, but not as bad as losing a finger.